The euphoria of discovery is the only motivation many scientists need for studying nature and its secrets. Yet euphoria is rarely expressed in scientific publications. This book, a personal account of more than thirty years of fieldwork by one of the world’s leading bat biologists, wonderfully conveys the thrill of scientific discovery. Theodore Fleming’s work to document the lives and ecological importance of plant-visiting bats has taken him to the tropical forests of Panama, Costa Rica, and Australia, and to the lush Sonoran Desert of northwest Mexico and Arizona. This book tells the story of his fascinating career and recounts his many adventures in the field. Fleming weaves autobiographical reflections together with information on the natural history and ecology of bats and describes many other animals and plants he has encountered. His book details the stresses and rewards of life in scientific field camps, gives portraits of prominent biologists such as Dan Janzen and Peter Raven, and traces the development of modern tropical biology. A witness to the destruction and development of many of the forests he has visited throughout his career, Fleming makes a passionate plea for the conservation of these wild places. 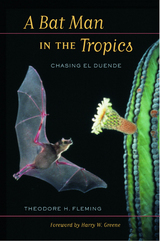 Theodore H. Fleming is Professor of Biology at the University of Miami, author of The Short-Tailed Fruit Bat: A Study in Plant-Animal Interactions (1988) and coeditor with A. Valiente-Banuet of Columnar Cacti and Their Mutualists: Evolution, Ecology, and Conservation (2002), among other books.